Get the original light-up disco experience. These nifty Flashing T-Shirts writing t-shirt combine an Electro Luminescence Graphic Equaliser display - you can display your own writing text. 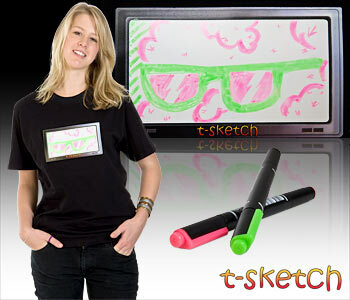 Its so simple, just write your message and flash the display. Mini pack or control unit, is removable for washing. !! !Pls do not buy cheap led t-shirts - click for more info!!! If you are looking for a Party LED Clothes Shop just check out GET-a-LED.com. You can find amazing LED t-shirts with equalizer responds to the music around you, jumping in time to your beats. These light up shirts are perfect stuff for party people, DJs, disco maniacs. Try out more than 50 designs of El shirts and buy for best price online.